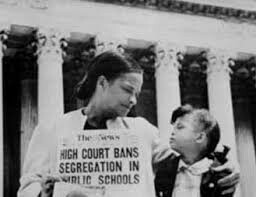 In 1954, it was ruled that segregation in schools was unconstitutional. 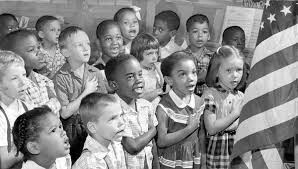 The U.S. began opening doors of schools to any child of any color. The 14th amendment states that everyone should be treated equally. 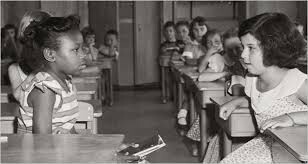 Many white Americans were upset that their children would be attending school with colored children. The supreme court finally ruled that separating children in public schools for race was unconstitutional. It was the end of legalized segregation, and it overruled the "separate but equal" idea. African American children were still bullied at school, but bullying is extremely difficult to get rid of. If you're different, you're bound to be bullied. There's not much anyone can do about it. Most people don't even know when and where it's going on, so it's hard to stop it. These kids went to school very different from each other on the outside, but on the inside they were all the same. Nowadays, children of all races go to school and nobody really even notices that they're different. It wouldn't be the same if that ruling of Education hadn't changed things. Linda Brown, from Topeka, Kansas was forced to travel a dangerous and long route to school because of segregation. Her father was a plaintiff, with the Supreme Court ruling that school segregation was unconstitutional. In 1950, the National Association for the Advancement of Colored people asked Linda's parents to enroll her in an all-white school, thinking that she wouldn't be accepted to attend the school. The plan was to have the civil rights group file a lawsuit on because of 13 families who represented different states. The case would be known as Brown v. Board of education, and it changed everything.